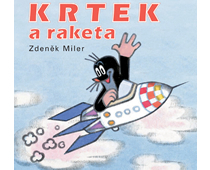 One November day Zdeněk Miler (90), the creator of the popular Little Mole films and books, including Little Mole and the Spaceship, received an unexpected piece of news. An American astronaut wanted to take a toy Mole into space on his last space shuttle flight. The astronaut, Andrew Feustel, chose Mole as a lucky talisman after consulting his family and Czech friends. Since Mr. Miller has brought joy to children and adults his whole life with his Mole stories, he was extremely pleased that a little stuffed Mole would be going with an American astronaut on this demanding mission, and would be keeping him company when he was far from home. It soon became clear that a unique stuffed Mole would need to be made for the space journey, and so Mr. Miller agreed that Mole could be altered in order to fit into the astronaut’s personal effects pack, and to meet other NASA requirements. It was not long before the first photographs from the training centre in Houston arrived. Zdeněk Miler was able to see how Mole, with his unique smile, underwent tests on the space shuttle’s simulator. One of the photographs showed Mole with the commander of the space shuttle Endeavour, Mark Kelly – the husband of the wounded congresswoman Gabrielle Giffords. The crew will need Mole’s optimism more than it initially seemed. Mr. Miler has never met Andrew Feustel, but he has his fingers crossed for the mission. 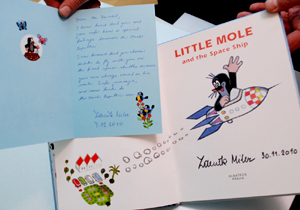 He was pleased to be able to send the Feustels a signed copy of Little Mole and the Spaceship for Christmas, in English translation. Zdeněk Miler is also happy that the project “Into Space With Little Mole” will be accompanied by various educational activities for children in various towns around the Czech Republic. 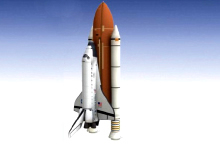 A further connection between Mole and the STS – 134 mission was created when a special logo for Into Space With Little Mole was created, to which Mr. Miler devoted a lot of attention.